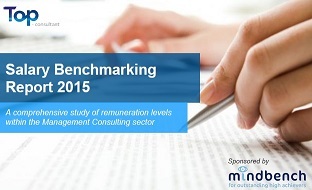 2015 Salary Benchmarking Report - A comprehensive study of remuneration levels within the Management Consulting sector. This is the fifth edition of this biannual report and is built on data gathered from thousands of respondents. Whilst most responding consultants were from the full-service global brands such as Accenture, Deloitte, EY and PwC, niche and top-tier firms such as McKinsey & Company, Strategy&, PA Consulting and Towers Watson were also represented. This free report presents basic salary, benefits and bonus levels reported by type of consulting and seniority level with expert commentary both from the Top-Consultant team and from our sponsors Mindbench.